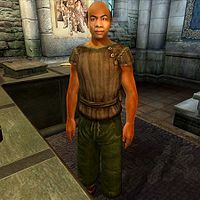 Willet is a Redguard, and the publican of The All-Saints Inn in the Imperial City's Temple District. He sells food and drinks and offers beds for rent. Willet never leaves his spot behind the counter, offering his services 24 hours a day without eating or sleeping. Willet wears a lower-class attire which includes a belted vest, some green felt linens and a pair of stitched leather shoes. He keeps an iron mace to ensure order in his inn and carries a small amount of gold. Speaking to Willet for the first time will have him warmly welcome your visit to his inn: "Welcome to the All-Saints Inn. I'm Willet, the publican." Asking him about the Imperial City will have him inexplicably offer advice on where to sleep in town, strangely excluding his own inn from this list: "Where to sleep? The Tiber Septim Hotel in Talos Plaza is nice but expensive. Luther Broad's Boarding House in Elven Gardens is just okay. The Bloated Float on the Waterfront is cheap... and a bit too interesting for my tastes." Asking if he has a room available for the night will have him reply: Yes, there's a room available. It'll cost 15 gold for the night. Are you interested?" If you claim that you wish to rent the room, but do not have enough gold, he will angrily claim that you won't stay at his hotel until you pay: "Unless you can pay for it, you're not staying in one of my rooms." If you have the sufficient funds to rent a room from him, and claim that you wish to rent a room from Willet, he will give you directions to your room: "Head downstairs, and the room will be straight across from the door. Sleep well." If you claim that you are not interested in renting a room he will accept your decision, and occasionally remind you to return to him if you change your mind. Asking him about the room again after you have already rented it will have him reply: "I hope the room meets your needs." Esta página foi modificada pela última vez à(s) 05h53min de 20 de outubro de 2015.